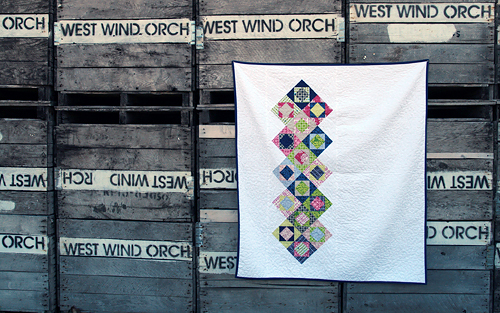 Despite the beautiful weather we've had here in Chicago over the last week, I managed to finish another quilt. I've had these blocks done for awhile now, waiting to assemble into a quilt top. I finally was able to work on that last week and then finished up the binding while we went on a trip to northern Michigan this weekend. 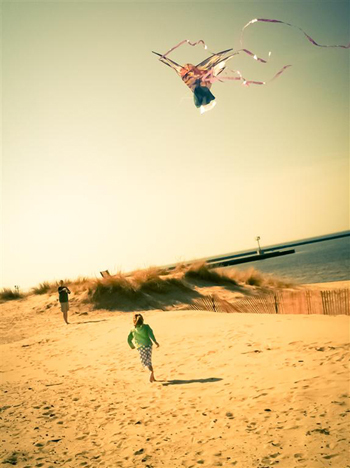 Check out this cool photo my mom edited for me of my husband and daughter flying a kite. 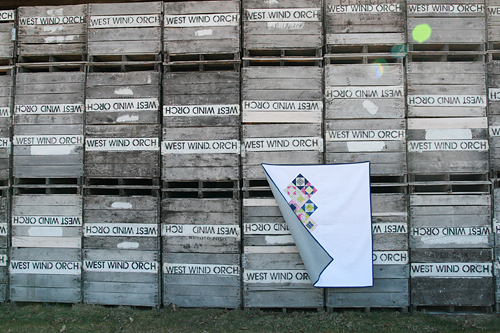 This block is no doubt attributed to many quilt designers, but one of those happens to be...Nancy Cabot! 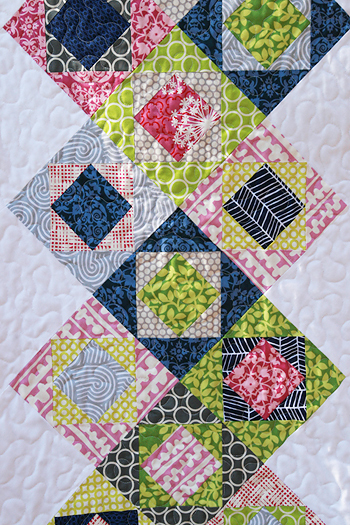 She called this block the "Thrift Block" and you can find a paper piecing template for it created by Tamiko of Patchwork Notes in this blog post. When I first made these blocks, I thought I would make about 25 and turn them into a mini quilt. Then I started brainstorming alternate quilt layouts and decided on a bit more unexpected layout. I am really thrilled with the finished quilt. Almost equally thrilled when we drove past this apple storage building on our trip and my husband suggested we stop for pictures! The backing is Kona Ash, the binding is probably my favorite deep blue print, Lizzy House's Outfoxed Jewels in Blue. The white is Moda's Bella solids white. I have a bolt of it and I really just think it is the softest white. I quilted this in a free motion meandering design and the finished quilt measures 53" x 59". This quilt is headed for a local charity auction here in Chicago in May, raising money for the Melanoma Research Foundation. Lots of New Fabric in the House!